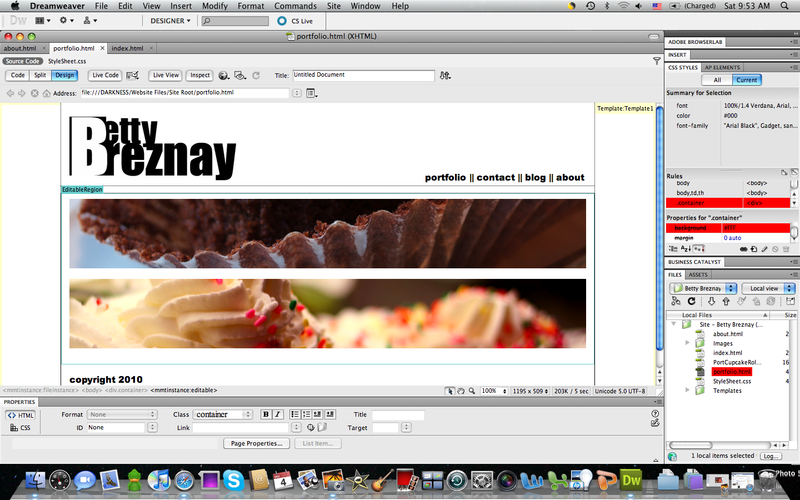 It’s so nice to be able to make a website in Dreamweaver from the comfort from my own home. But alas, after the huge to-do to download Adobe DW, I realize I also need Photoshop and Bridge to make my portfolio page. So for now, while I warm up, I can look at how pretty it’s coming along. But there will come a time, a few hours from now, during which I will have to brave the cold and hit the tech center. This entry was posted in Cupcakes, Temple University and tagged adobe, Betty Breznay, Breznay, desktop, dream weaver, dreamweaver, mac, make website, photoshop, portfolio, website. Bookmark the permalink.